It’s the gift that keeps on giving … Olbermann to the Goracle network? Keith Olbermann, the former top-rated host on the news channel MSNBC, will announce his next television home on Tuesday, and people on Monday familiarwith his plans pointed to a possible deal with the public affairs channel Current TV. Current TV, wouldn’t Olbermann have a greater viewership/readership on-line? According to reports, Olbermann would have the possibility to separately pursue other ventures, like an Internet destination. I would hope so with a TV channel that is only in 60 million homes and “usually provided only on the digital tier of cable television systems”. This will most certainly put the Goracle network on the map, NOT! I am with Hot Air, why would Olbermann settle for such a low rent job at such an unheard of network? Then again, Air America is no longer. More at NewsBusters … if the rumors are true, what is the over/under on the days, months, years that Olbermann will remain on Gore’s network before he wears out his welcome? The loony LEFT is not taking the demise of Keith Olbermann well. It has been just been a couple of days since Olbermann said farewell from MSNBC and the LEFT is still reeling with over the top, histrionic crazy talk. Moonbattery has some more tweets that will make you shake your head with the LEFT’s silliness. What is most interesting about the “hue and cry” throughout moonbatland is the fact that so many feel that Keith Olbermann’s speech has been silenced as if he could never get another gig. Or cant he? 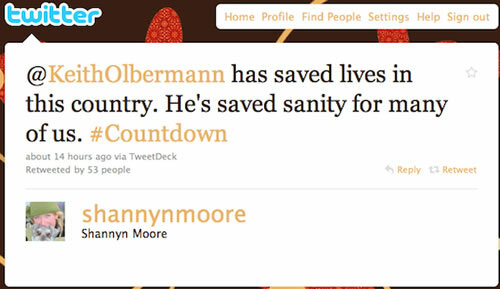 If Olbermann is such a hero of the LEFT, I am sure some liberal media outlet would hire him on his merits. There are certainly enough liberal MSM outlets in the industry, if he adds any thing to the conversation. Ultimately what does the LEFT have to say that their hero left MSNBC because of the $’s, not because of some noble progressive cause? What is lost in all the over the top histrionics of the LEFT claiming to have lost their “progressive” voice and the squelching of free speech is that Keith Olbermann left MSNBC because he wanted more money. 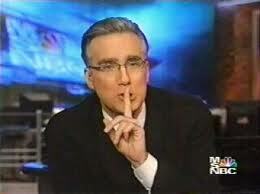 Simply speaking, Olbermann wanted more money, MSNBC disagreed and Keith Olbermann departed. As we learned, this was not a knee jerk reaction as seen by the last minute farewell from Olbermann, but weeks in the making of a contract negotiation. What will the LEFTthink that their hero was about money, not about the progressive cause? Yet in the end, Olbermann hardly has the ratings to play a game of chicken with management brass. The liberal hate continues from US Rep. Steve Cohen (TN-D) via the airwaves of MSNBC. Cohen went on to MSNBC and was interviewed by Ed Schultz following Cohen’s hateful comments where he compared Republicans to Nazi’s. As stated by NewsBusters, the interview began as some what of an apology from Cohen; however, it wound up being something much different. The irony of it all or is it just pathetic liberal, moonbat journalism. As Hot Air points out, during the MSLSD interview there was an “over the line” graphics up, yet never did Ed Schultz challenge Cohen. It would appear that Steven Cohen has become the new Alan Grayson for the Democrats. He continued his hateful rhetoric and lack of civility after saying that he has learned his lesson, Cohen went on to compare Pence to Nazi propaganda minister Joseph Goebbels and receiving no resistance from Ed Schultz. Where is the Ed Show in the ratings? With Keith Olbermann now a thing of the past on MSNBC, I would be awfully careful if I were Ed Schultz as he just might be next. with such low cable news ratings, Ed Schultz might want to watch his P’s and Q’s as who else would ever hire him if he loses his MSNBC gig. DING, DONG OLBERMANN AND COUNTDOWN IS GONE … GOOD RIDDANCE!!! Effective immediately, Keith Olbermann is out at MSNBC. It just goes to show you, ratings or no ratings, if new management thinks you are a liability, you are out. Keith Olbermann, the far left moonbat and MSNBC’s highest rated host is out, effectively immediately.